My mother in law has always made the Thanksgiving turkey with a dry brine and it turns out wonderfully juicy and delicious. 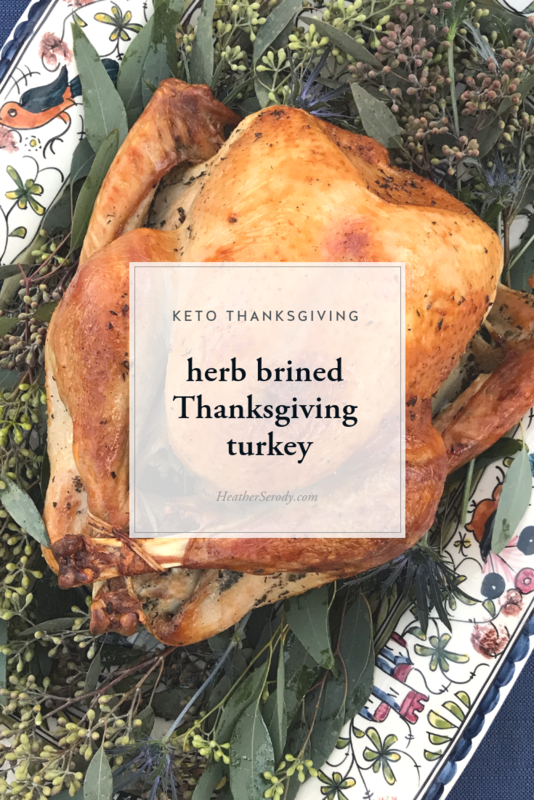 This year I experimented with a fresh herb brine instead of using dried and it was just as succulent but even more flavorful, despite the fact that my oven circuit board decided to fail during 3/4 of the way through cooking. (See the nice hotspot on the skin that happened whilst trying to finish cooking the bird on broil?) 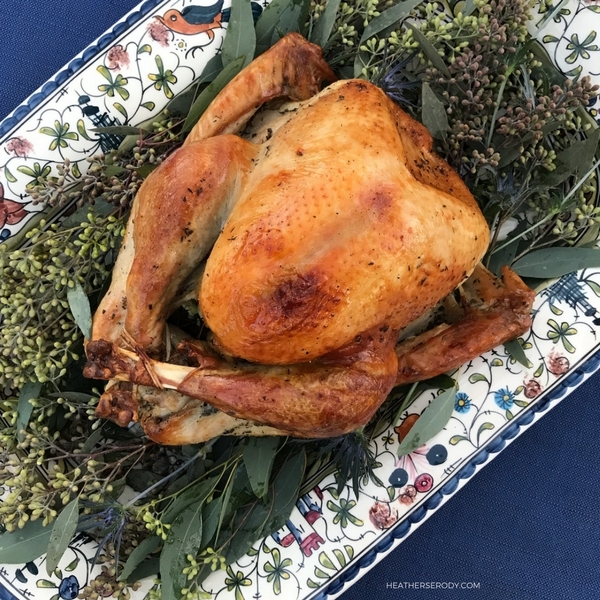 Turkey don't care – it STILL turned out amazing! 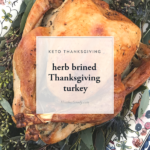 You're going to totally rock Thanksgiving with this fresh herb dry brine recipe. Many traditional dry brines add sugar, which is totally unnecessary for a succulent & flavorful turkey. The salt brine will help hold moisture in the turkey meat as it cooks, so I highly recommend using the high-quality coarse salt. My favorites are Redmond & Celtic coarse salt. I used to get so mad, but now I think it's hilarious that every single Thanksgiving my husband wrecks my simple meat thermometer because he always puts it in the dishwasher no matter how many times I tell him not to. This is why I now use a digital one with an alert button that will notify you when the turkey is done. It's actually way better than constantly opening the oven door to keep checking if the turkey is done. You'll also need a roasting pan with a rack, a turkey brining bag, and turkey lifters. Shopping resources are below the recipe. Remove any giblets from the turkey. Rinse the turkey & pat completely dry (do not skip this step) with a paper towel. Place the salt, pepper, herbs, 6 of the garlic cloves, and zest in a bowl and mix together with a fork. Rub the turkey all over outside & inside the body cavity with herb, garlic & salt mixture. Transfer the turkey to a resealable plastic brining bag. Push air out of the bag and seal. Refrigerate for at least 2 and up to 3 days, turning the bird over at least once every day. 7 hours prior to cooking, remove the turkey from the brining bag and pat dry with paper towels. Most of the herbs & salt will come off the turkey, this is fine. Make space in the refrigerator. Place the turkey, uncovered on top of a paper towel on a roasting pan or cookie sheet in the refrigerator for at least 6 hours to dry out the skin. This is so that the skin will crisp during cooking. 1.5 hours prior to cooking, remove the turkey from the refrigerator to allow it to come to room temperature. Heat oven to 400 degrees. In the bottom of a large roasting pan, add the stock and wine to fill the pan to at least a 1/4-inch depth. Generously rub the turkey all over with melted butter. Place turkey, breast side up, on a roasting rack set inside the roasting pan. Scatter the onions around the turkey. Quarter the lemon & microwave for 45 seconds - 1 minute, or until hot. Stuff the remaining 6 garlic cloves, bunch of thyme, Bay leaves, & hot lemon quarters & juice, inside the turkey cavity. Transfer pan to the oven and roast 30 minutes. After 30 minutes, the turkey breast should be lightly golden all over, then loosely cover the turkey with aluminum foil. Reduce oven temperature to 350 degrees and continue roasting until an instant-read thermometer inserted in the thickest part of a thigh reaches a temperature of 165 degrees, about 1&1/2 to 2&1/4 hours more. Transfer turkey to a cutting board to rest, covered with foil for at least 15-30 minutes before carving. Tip: while the turkey rests, make the pan gravy.